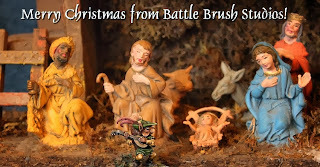 Battle Brush Studios: Merry Christmas! Just dropping by for a little Yuletide sing-song and indeed for wishing all clients, fans and friends of Battle Brush Studios a very merry Christmas. What or how ever or indeed if at all you celebrate something these days, have a good time and enjoy. Thanks to every one of you and I'll see you soon!